Studies indicate that adults who don’t strength train lose on average at least a half-pound of lean muscle tissue each year starting at about the age of 25. 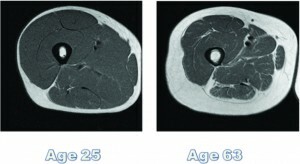 This process of muscle tissue loss is called “sarcopenia.” The following MRI images show the deterioration of muscle over time. The left image is the cross section of the thigh of a 25 year-old woman. The right image is the cross section of a thigh of a 63 year-old woman. The circle in the center of each is the thigh bone, the gray tissue surrounding the bone is the muscle tissue and the white section on the outside of the thigh is fat tissue. So…why is having less muscle like this such a bad thing? To begin, muscle tissue requires energy and calories to maintain itself every day. The more lean muscle you have, the more fat and calories you burn all day and night just to maintain your extra muscle. In other words, less muscle means a slower metabolism. As people lose muscle with age (sarcopenia), their metabolism burns fewer and fewer calories making it one reason why most people gain fat as they get older. Unfortunately, most people weigh more at age 55 than they did at 25, and their lost muscle tissue has been replaced by added fat. Here’s an example: Our female subject’s bodyweight on the scale is 20 pounds heavier now than it was in her twenties, she’s not only lost 15 pounds of muscle but also gained 35 pounds of unwanted fat. Muscle takes up less space than fat, so this woman is larger, less firm and has a slower metabolism helping to burn fewer and fewer calories. To regain her youthful figure, this woman would need to not just lose the excess fat she’s accumulated, she’d also need to add 15 pounds of body shaping lean muscle by performing effective super slow strength training. 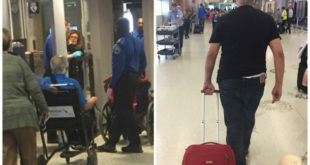 Luckily, just two 20- minute slow- motion strength training session per week will reverse and even stop this unfortunate lean muscle tissue loss and you will be “biologically” younger as you age.